Taste your way through San Francisco's Russian Hill on this 3-hour food walking tour. Meet butchers, cheesemongers, bakers and even a gelato maker. You're treated to generous tastings at seven different eateries that feature mouthwatering gourmet cuisine. Savor the bay views and classic architecture and hear intriguing tales from the city's past. 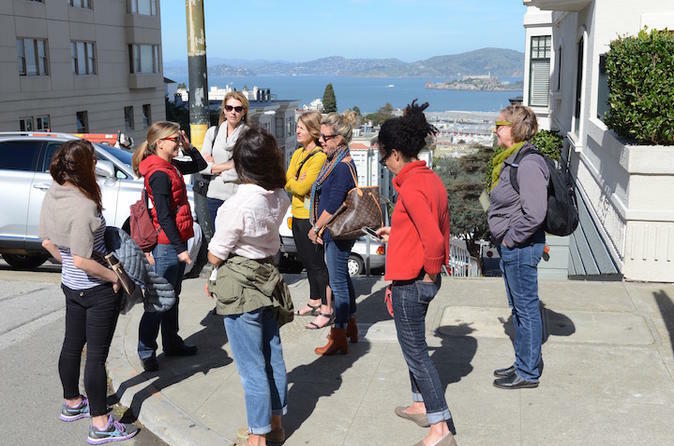 Meet your guide and small group at Macondray Lane, a pedestrian street located at Russian Hill, and embark on your 3-hour walking tour of this San Francisco neighborhood. The route covers roughly 1 mile (1.6 km) with stops at seven delicious eateries along the way. Your tasting itinerary includes enough food for lunch. Sample Baja-style fish tacos, New York pizza from a beloved neighborhood pizza joint, and meat and bone broth from a farm-to-fork butchery and restaurant. Indulge in gourmet cheese tasting from a popular local cheese shop and dig into homemade gelato made from scratch with seasonal ingredients. Finish with warm cookies from a boutique bakery and venture to a tea salon for a gung fu tea tasting. Please note: tastings are subject to change without notice. Most dietary restrictions can be accommodated.